You will live in a beautiful residence complex just a 10-15 minute walk from the campus in the leafy suburb of Aghia Paraskevi. These apartment-style residences feature fully-equipped kitchens, marble bathrooms and floors, complimentary on-site laundry facilities, a quiet study area, outdoor areas for BBQs and relaxing, and a large lobby with TV, DVDs and games for casual group gatherings. AIFS students will share a double room in a two to four bedroom apartment within a residence with free wireless and wired Internet available in all rooms and common areas. Each apartment has a fully-equipped kitchen with dishes and cooking utensils provided including a cookbook designed by previous student residents. There is a 24/7 fitness center on site with fitness machines and free weights and Resident Life Staff are on hand to assist with any questions. Single rooms may be available for a supplemental fee. It is a 10-15 minute walk from the residence complex to the campus facilities. Transport into the city center (by public bus and Athens’ modern metro) takes about half an hour. Students will receive an allowance worth $1,000 for semester students or $800 for quarter students to subsidize the cost of purchasing meals and groceries. The American College of Greece campus also includes a student cafeteria, coffee shop and a snack bar for the purchase of discounted meals. Semester students who do not wish to receive the meal allowance will pay a reduced program fee of $14,995 and fall quarter students will pay $12,195 for the program without meals. Students can also take advantage of the ACG Campus Dining Meal Plan at the campus cafeteria. Three plans are available for an additional fee. Students can sign up directly with ACG prior to the start of the semester when meal plan prices will also be provided. ‘Philoxenia’ is an important Greek word meaning ‘love of strangers’ or ‘love of foreigners’, and Greeks know that ‘philoxenia’ is at the heart of their great tradition of hospitality. The goal of the Philoxenia Program is to foster friendships and cultural understanding among the many nationalities at the college. A Greek student will be paired with a study abroad or other international student for friendship and cultural exchange. While there is no set time commitment, paired students are asked to communicate or get together every other week or so for lunch, coffee or just to hang out. As everyone knows, you cannot truly understand a new country without getting to know its people and their experiences. If you are interested in keeping yourself fit while abroad the campus at the American College of Greece is the perfect base for your study abroad experience. The state-of-the-art fitness facilities on campus include a fitness center with a full range of equipment, dance studios, soccer field and 400m running track, basketball arena, climbing wall and tennis courts. These facilities were used as the official training base of the 2004 U.S. Olympic team. The highlight is the Olympic-size 50m heated swimming pool set above the campus and overlooking the soccer field, Aghia Paraskevi and part of Athens. Long and short course swimming, water polo and scuba diving are some of the activities which take place here as well as some 1-credit academic classes such as Water Fitness. Lane six of its swimming pool is known as Michael Phelps’ lane! Students studying at ACG have the opportunity to take part in a non-credit bearing community engagement and service learning experience. Students are prepared for these field experiences with team building sessions, workshops on health and safety in the field, how to identify appropriate actions and reflect on them and talks on servant leadership. Examples of such experiences include volunteering at a local school, painting a nursery school, working with vulnerable people and visiting a refugee camp. A series of activities also take place in Athens throughout the semester when specific needs are identified. Hello! I am very much looking forward to welcoming you to Athens &endash; my home town. I studied economics at the American College of Greece (ACG) and then did postgraduate work in the U.K. I am very familiar with student life at ACG and at the same time, have first-hand experience of living and studying abroad. I am here to make you feel comfortable and safe, and provide you with all the vital information and guidance to get the most out of your experience in Athens, not as a tourist but with a glimpse of how locals enjoy their city, their walks along ancient paths, the coffee shops under the sun, local tavernas with traditional Greek cuisine, beaches and islands. 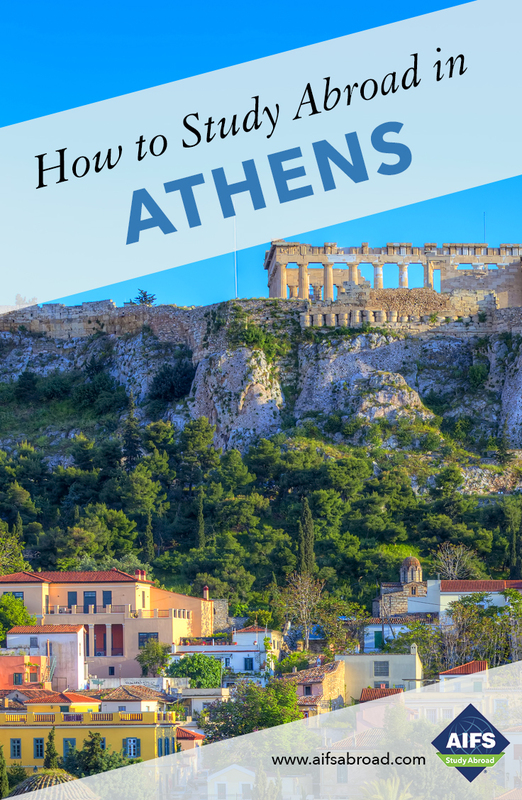 Athens is a beautiful city, one of the oldest in Europe with a unique blend of rich archaeological sights, numerous museums and a vibrant cultural life. The Athenians and Greeks in general are known for their philoxenia, graciousness and hospitality; they will welcome you with a smile!